The new packaging features vibrant colours and playful illustrations and aims to reflect Just Wholefood’s mission to make great plant-based food that’s easy to prepare and fits with a modern lifestyle, says the brand. 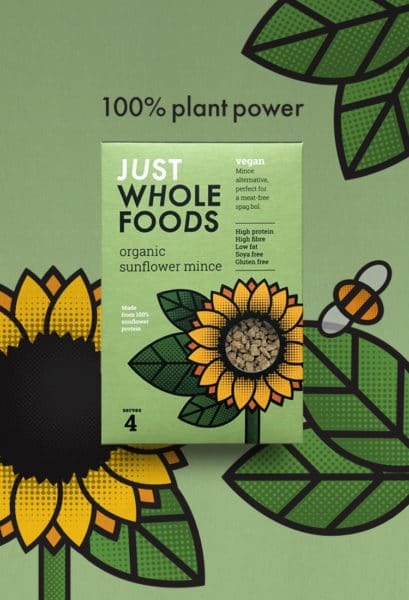 The packs feature simple signposting on both front and back of pack, with ingredients and key nutritional, vegan and free-from information clearly visible alongside easy step-by-step recipes. In addition to the pack redesign, all of the Just Wholefood range is now fully vegan certified and palm oil-free, and eight of the products are now certified kosher. The rebrand has secured new listings with Ocado, Planet Organic and Whole Foods Market.